Charlie Dog Came Too: A Short Trip Around East Anglia. A Short Trip Around East Anglia. Rob had been champing at the bit, pacing the floor and generally being rather annoying in the way only a bored man can be. Me? I don’t get bored. Rarely have. Besides, I have the novel still ongoing, so there is always something I should be doing. I even did a day’s paid work, so no room for boredom in my world. We should have headed off in the gloriously sunny days just after Easter, but we didn’t, and the weather during May was decidedly dull in the Midlands, with reports of gales in Scotland and rain in Wales – the two destinations we were hoping to visit. Pictures posted on the Motorhome Facts website, of vans trashed to matchsticks by 100mph winds in the Highlands, made us rethink a trip north and so we turned about to look to the gentler climate of Suffolk and Norfolk for a few days away. We packed up the van, having made a list of everything we’d had in it for the big trip by visualising the contents of the cupboards. Some list. We might as well have been utter novices – completely forgetting the camping chairs and table, which never fitted in a cupboard, so never got visualised! We hadn’t even managed to find the binoculars, so missed for a year away, but still lying in one of our packed boxes somewhere in the shed. On Wednesday June 1st, 2011, we left family in Bishop’s Stortford and headed east. We stopped for shopping in Woodbridge, where we found possibly the best bakers we’ve come across in the UK – The Cake Shop – which had a fantastic selection of breads, including Adnams sourdough. Having stocked up with tasty goodies, we continued on to Rendlesham Forest, where we rejected the idea of stopping at the crowded campsite (close to the site of what was apparently the UK’s most famous UFO incident in 1980). Instead, we phoned one of the Camping and Caravanning Club’s small certified sites, Bailiff Cottage, at Hollesley. It turned out to be a little gem of a site, and we spent two nights on the pleasant smallholding, while we sampled the various delights on offer in this chocolate box picturesque part of Suffolk. Bawdsey Quay, where the foot passenger ferry shuttles across the mouth of the River Deben to Old Felixstowe, was a great place to stop and picnic. There’s even a little beach and tearoom there, and the place where ground breaking radar technology was developed and first tested in Suffolk between the wars - if you’re that way inclined (http://www.bawdseyradar.org.uk/). At Bawdsey, East Lane, we explored the old gun battery, from where we could see the earlier defences of the Martello tower. The only battles seen there now are the ones to prevent the land being swallowed up as it takes its ongoing battering from the sea. This is an ever changing landscape, with some parts seeming more shifting than others. Shingle Street is one such place, although it has been there for a couple of centuries. It’s little more than a stretch of pebbles with a few nesting terns, and does give an impression of impermanence. Strangely, it has been the centre of conspiracy theories since it was evacuated in the 1940s. The speculation centres on whether it was the site of a foiled invasion attempt by German forces, but includes rumours of a shoreline littered with burning bodies, schemes to protect the coastline with an impenetrable barrage of flames and the testing of experimental chemical bombs – exciting stuff for a tiny coastal hamlet. We moved on round the Suffolk coast on Friday, via Orford, another pretty coastal village with its quay bustling with children dangling crabbing lines into the water as fishermen and pleasure sailors come and go. Orford is also a bit of a must for any foodies, with its fresh and smoked fish, a couple of very decent restaurants and an award winning butcher. It also has a massive car park which can take quite a few motorhomes. It would have made a great overnight spot, just opposite a pub and restaurant, if it were not for the signs banning you from sleeping in your motorhome there – sigh! 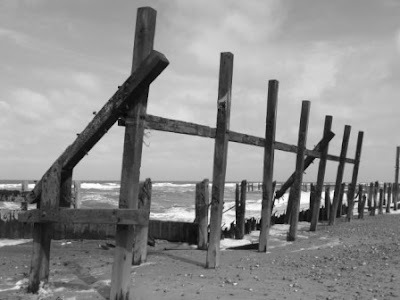 Instead, we drove to one of our all-time favourite places in East Anglia – Happisburgh in North Norfolk. The cliff-top campsite there has grown progressively smaller over the 28 years we’ve been going there, with considerable parts of the village now toppled into the sea, but what’s left remains charming. It can be glorious at Happisburgh, but is often windy – and so it was over our weekend – with battering gusts preventing us from sitting out in the sunshine. Most people set up wind breaks, not us of course, but the chap in the caravan next door made up for it by erecting what can only be described as a stockade. On Sunday we drove back to the Midlands, fortified to search for jobs and houses – or houses and jobs – we’re not sure of the order of importance there, and with a list of things to add to our list of things not to forget when we pack up the van.